Hello, my name is Jim and I have been active in the field of education for more than 25 years, first as a Captain and Flight Instructor with Trans World Airlines where I helped hundreds of pilots achieve their F.A.A. pilot endorsements on such aircraft as the Boeing 707 - 727 - 737 - 747 - 757 and 767. 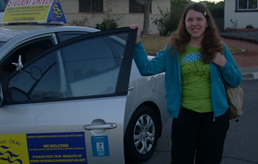 I have flown them all in my time as an International Airline Captain and have brought that same standard of excellence to my Driving Academy here in Las Vegas so that the young at heart, regardless of age, can experience and enjoy the freedom and pleasure that having a Driver License can bring into their lives. Our students have ranged in age between fifteen and a half years of age to eighty-five years of age and every age in between, and all have been warmly welcomed here because as you'll soon discover, our dedication and patience are boundless. So call us today - Call us right now!